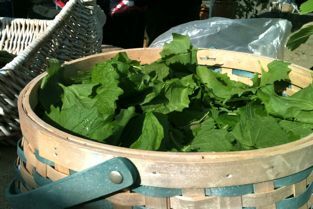 This bright Saturday morning marked the fourth consecutive week of the Midtown Farmers Market 2011 season. May is a month of many market openings, but it never quite feels like real farmers market season since the crops aren’t quite growing and the weather is inconsistent, even for Minnesota. May 7th, opening weekend, was beautiful: sunny and warm, and, thanks to the magic of Peter and Carmen’s greenhouse we even took home some very early spinach. The next two weeks were not so inviting: week two featured cold drizzle and wind (we missed that week, as Martha mentioned) and week three was also wet. Owners of full rain suits such as Martha and myself were rewarded with our first taste of the celebrated stalks of springtime, asparagus and rhubarb. In light of the dreary last two weekends, this morning’s sun was a bright beacon calling us to the intersection of Lake Street and Hiawatha — it’s starting to feel like the season is really upon us. Once again we were rewarded with abundant rhubarb and asparagus — abundant at 8:30 am, at least; the early season can be brutal to the late risers out there. 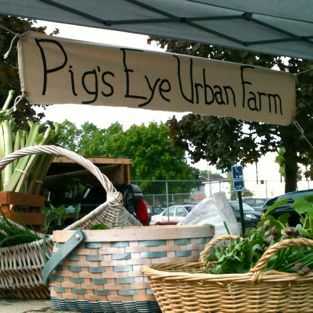 I was pleasantly surprised by the produce available from market newcomers Pig’s Eye Urban Farm of Saint Paul. 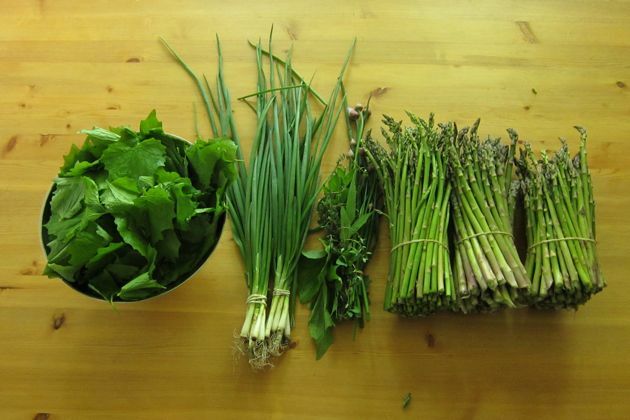 Besides rhubarb, which they had last week, they had the first spring onions I’ve seen this year, brilliantly-marketed bundles of herbs including thyme, sage and chives and, most interesting, garlic mustard greens. 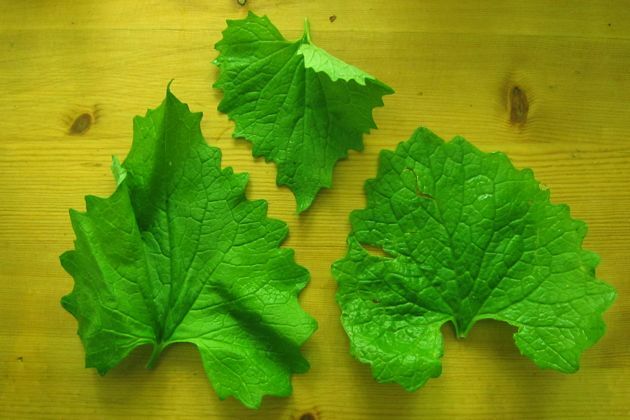 These last are not actually a cultivated product but were found growing wild on one of the plots cultivated by Pig’s Eye in the capitol. 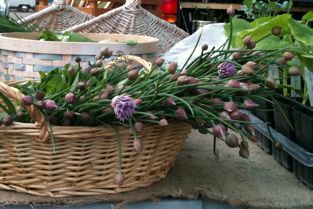 It is always nice to find foraged food at the market; urban-foraged food even more so. The greens, which I got to taste before buying, have a really strong, hot garlicky flavor. I think they’ll pair nicely with arugula (not seen at a farmers market yet this year, but grown in WI and sold in my year-round farmers market, the Wedge) in a salad with whole mustard vinaigrette. And they were definitely a steal at $1 for a good-sized bunch. Besides the Pig’s Eye produce I also bought another three pounds of asparagus, bringing my total to 7 pounds for the season so far. Not bad for two weeks! I hope to get the chance to share with you some of the things I’m doing with it, but at the moment I’m too busy cooking and eating it all. 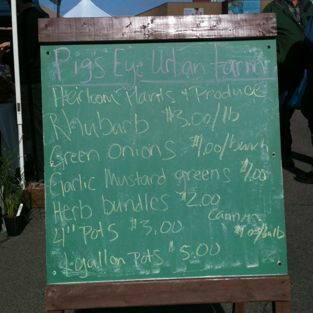 This entry was posted by Tom on Saturday, May 28th, 2011 at 12:14 pm and is filed under Farmers Market, Minneapolis. You can subscribe to responses to this entry via RSS.